Refutation Of Christian PolemicsThat Christians were the source of some of the worst lies and distortions about Islam should come as no surprise, since Islam was its main "competitor" on the stage of World Religions. 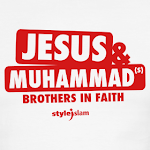 Far from honouring the commandment not to bear false witness against one's neighbour, Christians distortions and outright lies about Islam and Prophet Muhammad were widespread. Starting from John of Damascus to the modern day Robert Morey, very little has been changed as far as the content is concerned. Rebuilding The Past: Western science owes much to Islam’s golden age - a debt that is often forgotten. To help redress the balance, Fuat Sezgin has reconstructed a host of scientific treasures using ancient Arabic texts. Alison Abbott reports in the top scientific journal Nature.